Combine cookie pieces and butter; press onto bottom of 9-inch square pan. 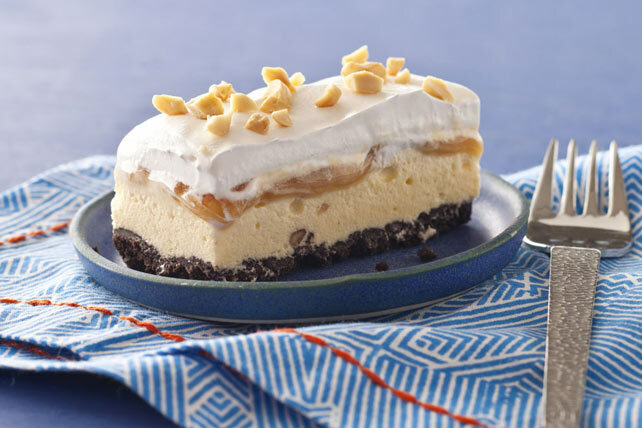 Spread ice cream carefully over crust; drizzle with caramel topping. Cover with Cool Whip and nuts. Prepare using your favourite flavour of ice cream. Line empty pan with plastic wrap, with ends of wrap extending over sides. Prepare dessert as directed. Use plastic wrap handles to lift dessert from pan before cutting to serve.